I have long considered Hawaii to be one of the ultimate eating destinations in the world. Plopped in the middle of the Pacific Ocean, in between the mainland American continent and Asia, is a heaven for foodies. Influenced by so many different countries, each bringing with them their own cuisine, Hawaii has developed and perfected flavors that are now signature to the islands. Although you can still find plenty of traditional Hawaiian food (which is similar to Polynesian food), many of the fusion Asian inspired dishes are the most popular. Here are 5 incredible fusion eats in Hawaii that you shouldn't miss! Nothing goes better with the beach and a day of surfing than a plate lunch. A plate lunch is the combination of two scoops of steamed white rice, one scoop of creamy macaroni salad, and a meat of your choice all piled into a takeaway foam container. 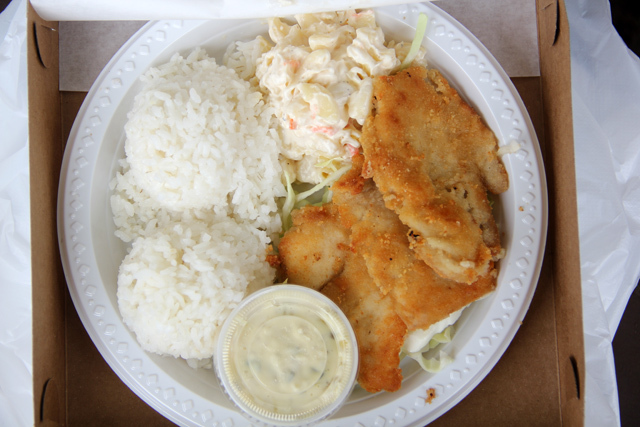 Some of the most popular choices include teriyaki chicken, chicken katsu, or fried mahi mahi. The meats are often Asian Japanese influenced while the addition of macaroni salad and the giant portion sizes are Hawaiian inspired. Many plate lunch restaurants will also offer a mini, which includes less rice and less meat. SPAM is not the most beloved thing to eat on the mainland of the United States, in fact I've met many who are't overly fond of the tasty block of pink preserved meat – but in Hawaii things are different, SPAM is treasured. 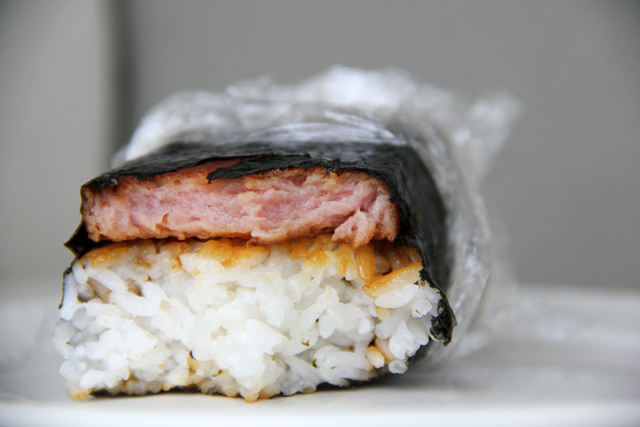 One of the ultimate marriages of Hawaii and Japan is the SPAM musubi, a seaweed roll filled with a thick slab of fried SPAM luncheon meat. Beginning with a piece of seaweed, rice is added, then a piece of SPAM, and finally the treat is wrapped up and smashed into a rectangular package of goodness. I it weren't so unhealthy, I could probably eat a SPAM musubi everyday for the rest of my life! 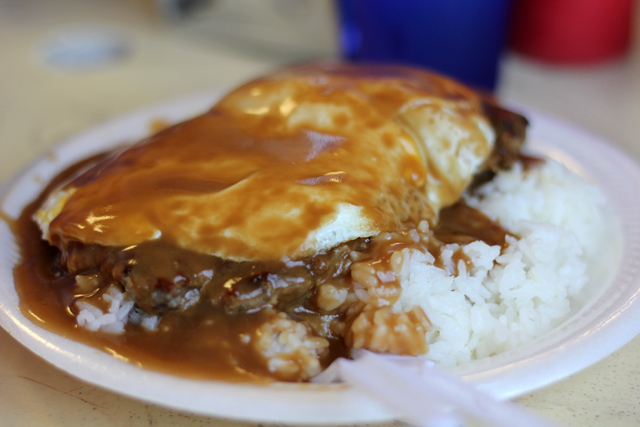 The hamburger is arguably the most famous of all American foods, but while it's normally enjoyed pressed between two buns, in Hawaii you have the opportunity to eat a burger in a loco moco. Take a foam container, fill the entire bottom with fresh steamed rice, pile on a a few giant sized fried hamburger patties that are mixed with onions and seasonings, pour an abundance of beefy brown gravy on top, and you've got a comforting Hawaiian fusion loco moco. 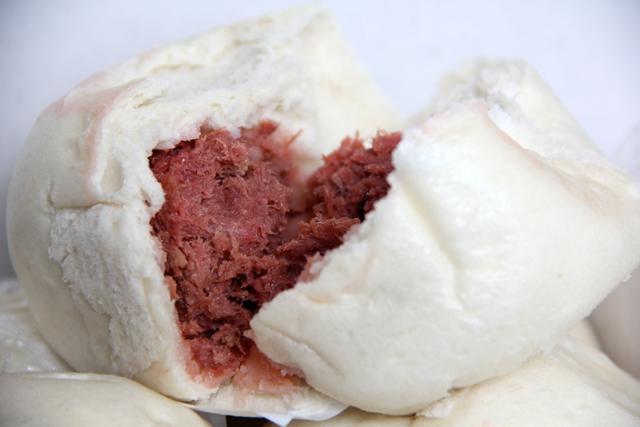 Chinese steamed buns known as baozi, are what Hawaiian manupua originally stemmed from. While you can easily find authentic Chinese steamed buns in Hawaii, some of the tastiest ones have been slightly modified to a local Hawaiian flavor. Take a ball of dough, stuff the insides with a porky or meaty or even veggie filling, steam or bake it, and you've got manapua. In Hawaii you can get all sorts of delicious fillings like the common char siu (Chinese red barbecued pork), kalua pig (a Hawaiian food), or even chicken curry! Hawaiian shave ice is not as crazy as a Filipino halo halo yet it's not as plain as an American snow cone – it's a masterpiece in between. Hawaiian shave ice is constructed of finely shaved ice that's molded into a cone, bowl or cup and drenched in sweet fruity flavored syrup. You can also choose from a variety of other toppings or condiments like sweet red azuki beans, sweetened condensed milk or even ice cream on the bottom. 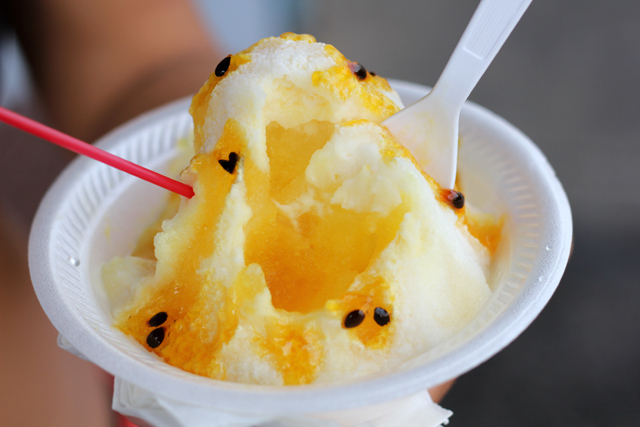 One of my favorite shave ice combinations is the duo of passion fruit (lilikoi) and coconut cream (haupia) topped with sweetened condensed milk. Hawaii is truly a melting pot of cuisines combined into a unique set of extremely appetizing dishes. During a day of enjoying the beauty of the islands there's no greater pleasure than sitting back and relaxing with a takeaway container of Hawaiian fusion food! Very interesting to see, as I hadn’t heard of this. But… well, while it looks filling, with the exception of the manapua and the shave ice it honestly doesn’t look like particularly good eating. Maybe I’m just being a foodie snob, but surely there’s something with more fruit, more color? Hawaii does have a lot of fruit and other dishes as well, these are just 5 famous dishes that are a fusion of different cuisines and are particularly known as comforting dishes in Hawaii. Other Hawaiian dishes like laulau or poke or seaweed salad are other things I really enjoy eating! mmmm shave ice over ice cream–my favorite! Rude rude rude! You have me pining for all of my favorite local foods! I adore spam musubi and I make myself loco moco every chance that I get. Matsumoto’s shave ice is the absolute best on the islands (okay, I’m biased) and come in a variety of different flavors.